Had dinner with the kids and grandkids tonight. Sarah's sister was in town and joined us for dinner. After dinner we went out to take our family photo--a tradition I want to continue to try and do each July. Sarah's sister, who is a photographer, took the pictures for us so I didn't have to use the tripod. We got some really great photos. 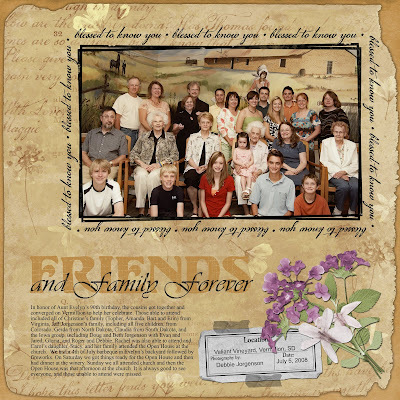 I also received my July ScrapSimple club yesterday and used it to created a layout for the group photo taken at Aunt Evie's 90th birthday celebration. Below is the layout and a couple pictures taken tonight. The pictures are SOOC--no retouching has been done.